Home News Recreation Walking the Carriage Trail in Charleston, W.Va. Walking the Carriage Trail in Charleston, W.Va.
Few of the trails I’ve walked compare to the Sunrise Carriage Trail, once the winding approach to Sunrise, the stately residence of William Alexander MacCorkle, ninth governor of West Virginia. Now a municipal thoroughfare, the trail ascends 180 feet over a .65-mile route from MacCorkle Avenue (US-60). 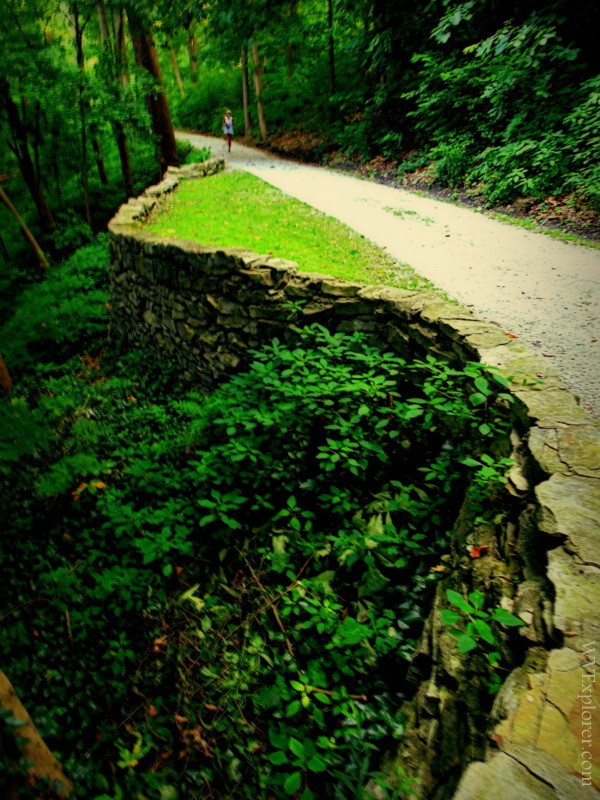 Have an hour to spend immersed in exercise in a lush, historic landscape? 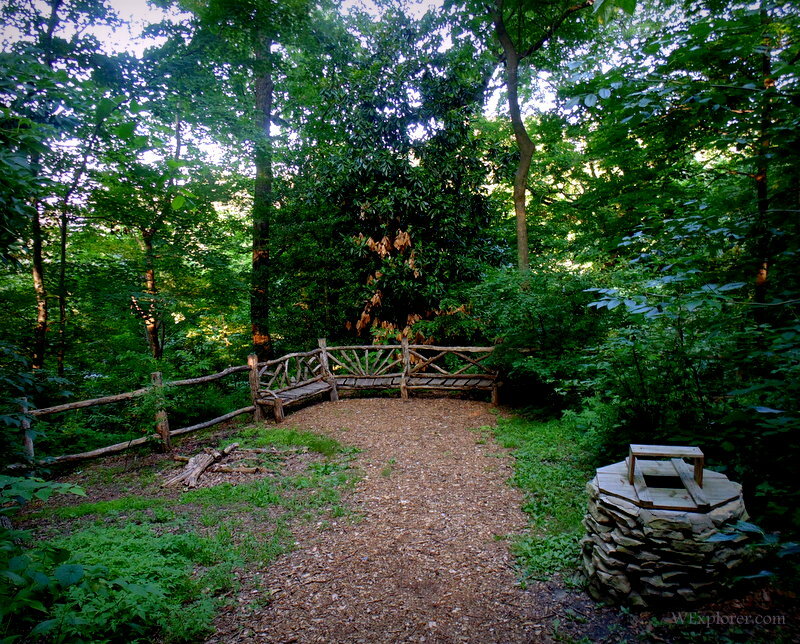 The Carriage Trail has it all — including at least two ghosts, if tales be true. Chareleston’s historic C&O Station overlooks the Kanawha River near the lower trail. The Sunrise Carriage Trail begins at the foot of the hill behind the historic Chesapeake & Ohio Station. The lower course of the trail parallels Bridge Road, which can be seen ascending into the South Hills neighborhood behind the station. A map at the end of this article will help orient visitors to parking areas at both trailheads. Daylillies blossom in mid-June near the lower end of Carriage Trail. Near the lower end of the trail a spray of daylilies blossoms, one of many flowering species, native and introduced, that follow the course. Wildflowers native to the state’s southern woodlands blossom in profusion along the steep hillsides in spring. 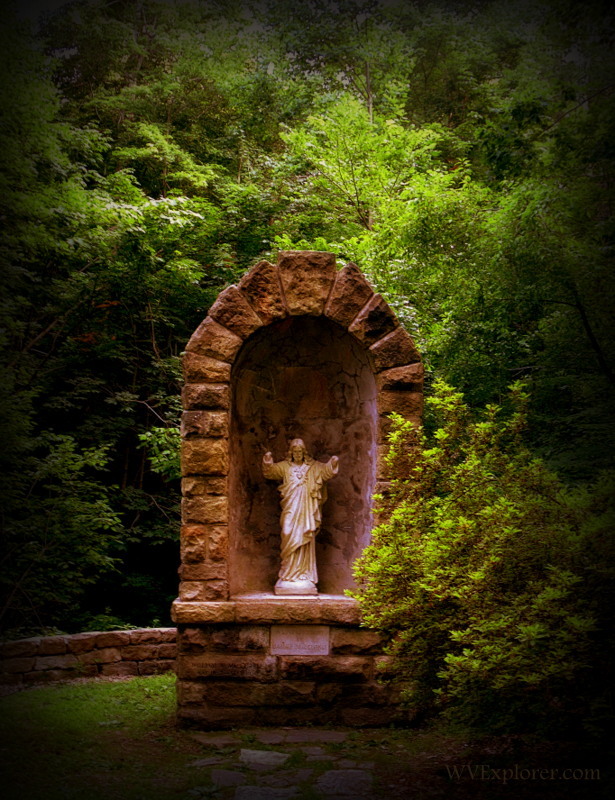 Spirits may linger near this monument deep in the hollow along Carriage Trail. During construction of the trail in 1905, builders unearthed the bodies of two women who Governor MacCorkle identified as executed spies. He instructed that the bodies be reburied and had this marker raised, though legend has it that their restless spirits haunt the hollow. A lone column rises like a sentinel in a curve on the Carriage Trail. 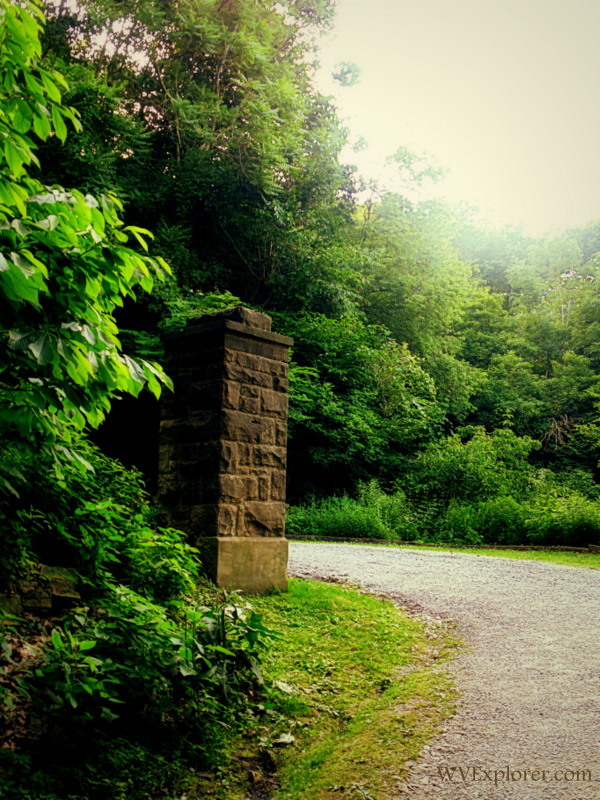 Three massive columns stand along the trail, guarding its upper and entrances and this bend along the middle course. MacCorkle also had a series of stone benches cut and placed along the route. The approach to Sunrise was designed to impress, which it most certainly did. Billy Sunday, John Phillip Sousa, William Jenning Bryan, and Adalai Stevenson were among the MacCorkle’s esteemed guests. Largely unmortared, stone walls and foundations follow the course of the trail, often integrated with cliffs and boulders along the route. Despite more than 100 years of use, the walls show little sign of deterioration. Monument to the memory of Isabelle MacCorkle on Carriage Trail. Following the delivery of a commencement address at Hampton-Sydney College in 1926, Governor MacCorkle, his chauffeur, and his daughter Isabelle were injured in a wreck on US-60 near Rainelle, West Virginia. Isabelle died the next day. The governor selected this location on a bend in the trail near Sunrise as the site for the monument, beneath which his own ashes were later buried, according to historian Billy Joe Peyton. The current statue in the monument has replaced an early version which had been vandalized. Rough-worked benches beckon tired hikers on the upper Carriage Trail. On any given day in summer you’ll find quiet places to rest along the trail, both immediately on the drive or in coves such as this. Ideal for yoga classes, painting courses, and romantic interludes, such waysides help make the trail an ideal recreational resource.